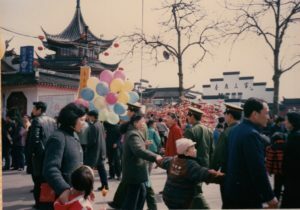 Celebrating Chinese New Year in a Bygone Era | WWAM Bam! Have you ever lost a meaning in translation because you didn’t quite understand another culture? That happened to me the first winter I lived in Hong Kong, back in 1990-91. 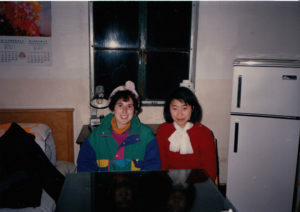 A couple years earlier, I’d traveled to China with a group from my high school. 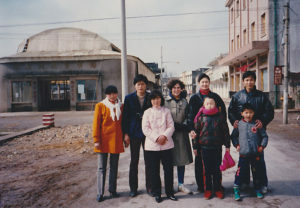 Our tour guide, Mr. Chen, told us that if we ever made it back to China, we’d be welcome to stay with him and his family. Hah! I took him literally. Since I was studying Mandarin in Hong Kong–where hardly anyone spoke it–I was eager to go away at Chinese New Year to practice it. And of course I thought about Mr. Chen up in Nanjing and his standing offer. I wrote him a letter in choppy Chinese (I was learning both simplified and traditional characters at that point and was utterly confused). Since he was an English teacher, he answered in English and wrote that it might be best to discuss the dates over the phone. I wanted to go there smack dab in the middle of Chinese New Year, but had no clue what that involved. None. At. All. It wasn’t easy to call someone in China back then, even from Hong Kong. I had to find a phone that would connect to an operator in China. The warden (faculty advisor) in my hostel (dorm) was a lovely Canadian woman who had family in China, so she offered to lend me use of her phone. I knocked on Dr. Tang’s front door one night, Chen’s number in hand. She showed me the chunky black rotary phone in her living room and left the room when I made the call. The low pitched ring tone sounded after I’d punched a number to connect to China. So I knew I’d done something right. When the operator answered–in Mandarin–I gave her Chen’s number and by a stroke of luck she understood my Mandarin. Chen answered and we made arrangements for my trip, one that added another layer to the stress that is traveling during Chinese New Year. One of the couple times I flew Dragon Air into China, I landed in Nanjing several days before Chinese New Year. In 1991, Deng Xiaoping hadn’t yet made his southern to-get-rich-is-glorious tour. Things were still rustic, but had character. 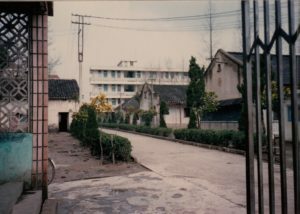 This is the apartment where the Chens lived. Chen introduced me to his students, including Wang Xi, who had us over for tea in her studio apartment near her university. Guess why I’m bundled up inside? Since it was Chinese New Year, the Chens had lots of family to see. 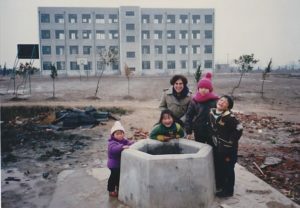 So they took me with them, both to a smaller city in Jiangsu province and the countryside. I played outside with kids in the small city. Here we are next to an open well! 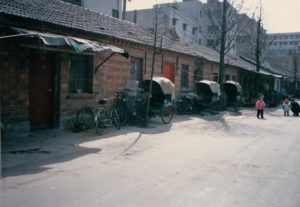 The small city looks like a ghost town, but half a million people probably lived there. I can’t remember the name of it. 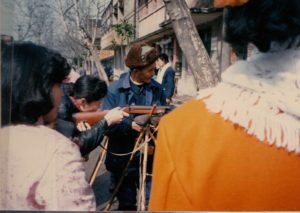 Mr. Chen’s wife taking aim at a carnival game. I was having a hard time dealing with no heat, but in the countryside there weren’t any toilets either. I think I took this photo after I’d gone outside to find a hole after drinking gallons of hot tea to stay warm. 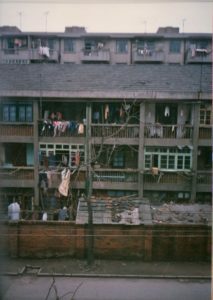 While I moved back to Hong Kong a few years after I left in May 1991, I didn’t spend a Chinese New Year there until 1998, weeks before I left Hong Kong for good. 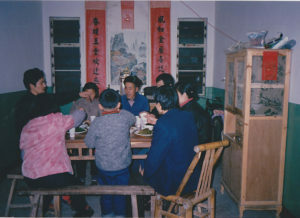 I spent those other Chinese New Years in a small city in Hubei province, without heat. Do you have a memorable Chinese New Year experience? It was traumatic! But I felt for the people who lived there and had to deal with this all the time. That said, when my former inlaws moved in with us in San Francisco and had indoor heat for the first time, they didn’t really like it. It was too dry and caused static electricity, which they’d never seen before and couldn’t quite understand. They preferred what they were used to. I’m definitely glad I had that experience, although I don’t need to go without heat in the winter again!